FluMist Quadrivalent vaccine (LAIV4) has been updated for the 2018-2019 season, and is once again recommended for use. Vaccine viruses included in the 2018–19 U.S. trivalent influenza vaccines will be an A/Michigan/45/2015 (H1N1)pdm09–like virus, an A/Singapore/INFIMH-16-0019/2016 (H3N2)-like virus, and a B/Colorado/60/2017–like virus (Victoria lineage). Quadrivalent influenza vaccines will contain these three viruses and an additional influenza B vaccine virus, a B/Phuket/3073/2013–like virus (Yamagata lineage). Monitoring during the 2018 – 2019 season will yield more safety monitoring data concerning pregnancy and influenza vaccinations, and anaphylaxis in persons with an egg allergy. Anyone can get the flu; it is contagious disease spread by coughing, sneezing, and close contact. Flu strikes suddenly and can last several days. Flu is more dangerous for infants, young children, adults over 65, pregnant women, and people with certain chronic diseases and weakened immune systems. A dose of the flu vaccine is recommended every year for those over the age of 6 months. CHOP Video: How are Strains of Influenza Chosen for the Annual Vaccine? 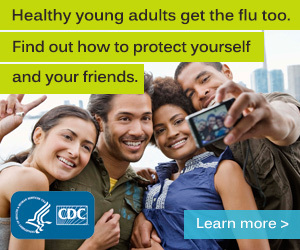 Free Print Materials from the CDC. Influenza is a highly infectious viral illness. The name “influenza” originated in 15th century Italy, from an epidemic attributed to “influence of the stars.” The first pandemic, or worldwide epidemic, that clearly fits the description of influenza was in 1580. At least four pandemics of influenza occurred in the 19th century, and three occurred in the 20th century. The pandemic of “Spanish” influenza in 1918–1919 caused an estimated 21 million deaths worldwide. The first pandemic of the 21st century occurred in 2009–2010. Influenza is a single-stranded, helically shaped, RNA virus of the orthomyxovirus family. Basic antigen types A, B, and C are determined by the nuclear material. Type A influenza has subtypes that are determined by the surface antigens hemagglutinin (H) and neuraminidase (N). Three types of hemagglutinin in humans (H1, H2, and H3) have a role in virus attachment to cells. Two types of neuraminidase (N1 and N2) have a role in virus penetration into cells. Influenza A causes moderate to severe illness and affects all age groups. The virus infects humans and other animals. Influenza A viruses are perpetuated in nature by wild birds, predominantly waterfowl. Most of these viruses are not pathogenic to their natural hosts and do not change or evolve. Influenza B generally causes milder disease than type A and primarily affects children. Influenza B is more stable than influenza A, with less antigenic drift and consequent immunologic stability. It affects only humans. Influenza C is rarely reported as a cause of human illness, probably because most cases are subclinical. It has not been associated with epidemic disease. The nomenclature to describe the type of influenza virus is expressed in this order: 1) virus type, 2) geographic origin where it was first isolated, 3) strain number, 4) year of isolation, and 5) virus subtype.